On the night before I left for college, when I was eighteen, I finally started my first real diary-like journal, and I’ve been keeping one pretty consistently ever since. I currently have twenty-eight volumes. That doesn’t include those old “poetry journals” I made, or the few dream journals I kept, or the many writers’ notebooks I’ve compiled in the last few years. That’s twenty-eight journals full of pages and pages and pages of writing about my life. Of talking to myself on paper. Of all the love and loss and contentment and craziness crammed in my little brain. Some people have trouble keeping a journal for a month, much less twenty-one years. (Yep, I’m 39. Good job on those math skills.) So how did I do it? How did I keep a journal going for more than two decades? I’ll tell you. Yes, I’m serious. This doesn’t apply to people working on a novel. In that case, yes, you should probably write everyday (even though I consistently fail at that). But when it comes to journaling, the quickest way to kill the habit is to put undue pressure on yourself. If you tell yourself you HAVE to write everyday, one of three things is going to happen. A) Pretty soon you’ll miss a day and then you’ll feel like a failure and you’ll give up. B) You’ll actually write in it everyday, but soon your entries will start to sound like this: Bought milk on the way home. Did some laundry. Um… what else? Congratulations! You’re writing a journal no one (not even you) will ever want to read. C) You’ll write every single day, and it will become easier and easier, and your entries will get longer and longer, and you will learn so much about yourself, and when you finish the journal you’ll realize it contains the memoir you’ve always wanted to write, and it’s publishable immediately with no revision! Just kidding. C doesn’t happen. It turns out there were only two choices. Here’s the deal: when it comes to your journal, sometimes distance makes the heart grow fonder. Think of it like a really good friend who you don’t see every day. Isn’t it more fun to get together when you have life stuff to catch up on? Keep your journal handy—it should never be far—but let it rest a little while you gather some things to tell it. Next time you pick it up, you may write something worth reading. 2. Skip to the Good Stuff. When you do pick up your journal and start to write, don’t feel like you have to fill it in on every detail of your life. If you did that to your friend, her eyes would glaze over pretty quickly. Show your journal the same respect. I don’t know how many times I’ve scribbled out four pages of babble until my hand was sore and THEN written, “But what I really wanted to write about was…” When I do that, the big news often gets short-changed in the entry. Then again… if you wait until you have “good stuff” to write about, your journal may stay closed for months, and that’s no good. The truth is, there’s “good stuff” happening all around us almost every day. Consider this—who’s this journal for? You, right? What will YOU want to look back on in ten years? Chances are, you’re going to remember the big things. Your wedding, your novel getting published, that time you won $7,000,000 in the lottery—those are going to stick with you. What you’ll crave are the little things. The tiny little slices of life that you’ve forgotten about. So your job when journaling is to master the mundane. Where are you? What are you wearing? What are you listening to? Personally, I’m sitting in my office at home at 10:23PM, wearing my polar bear pajamas (pretty new) and my faded black Dirty Dancing t-shirt (very old), and my iTunes just started playing “Cheating Man” by Jeff Plankenhorn. That right there will tell me more about life at this moment than anything else I can think of to say. Write small now and it will have a big impact later. Write upside down. Doodle. Skip a page. Use a big fat Sharpie. This is YOUR JOURNAL. Whatever rules you’re following came from YOU. You can change them. If you’re using a guided journal, don’t be afraid to stray from the path. Ignore the question of the day and write whatever you want. When you find yourself going on more and more tangents, you’ll know you’re ready to tackle the blank page. I contemplate journaling theory in the second entry of my first ever diary-journal in August 1995. I must have come up with a point, since I kept writing. You’re doing it! You’re finally keeping a journal! You’ve written so much! Now what? Let a little time pass, and then go back and reread. This is a wonderful experience. Yes, you’ll probably cringe a little. There will be at least one point where you’ll blush uncontrollably, look around to make sure your mom/dad/husband/high school crush is not reading over your shoulder, and then slam the cover shut anyway, just in case. But you’ll also laugh and smile a lot and maybe even find a few treasures. I have a ritual I like to do. When I finish a journal, I like to flip back to the first page and read the first sentence of every entry. Sometimes just those snippets tell a story. Take the time to find a journal you really love. There are so many styles and varieties out there, you should be able to get something that’s comfortable and fits your personality. But don’t choose something so fancy and expensive that you’ll be afraid to write in it. Your journal shouldn’t be a shrine. Let it get messy. In addition to a good journal, you also need a good bookmark. Whether it’s a cute little tasseled thing with a kitten on it, a photograph, a fall leaf you picked up in the park, or simply the closest not-too-crinkled post-it note, use something to mark your progress through your new adventure. If you’re like me, as the marker approaches the finish line, you’ll find yourself writing more. Oh how I love to finish things! 9. Enter the Cloud, If You Must. Let’s say you start a journal. Let’s say you take my advice and don’t pressure yourself to write every day. Or every week even. Let’s say that… oh… SIX MONTHS go by without you writing in your journal. Or LONGER. There’s NO WAY you can catch up on everything that’s happened since you’ve been gone. You don’t even remember the big stuff, much less the small stuff. That blank page of failure is staring up at you. What do you do? You pick up your pen. You write down today’s date. You jot down the time. You take a deep breath. You write, Hello journal. I’ve missed you. And you go from there. Just be yourself. Just have fun with it. Just write. Journals are very forgiving creatures. There’s no way to do it wrong. For a sneak peek into some of my old journal entries, check out this post from my previous blog. Good rules! Even the ones I break! Wonderful tips, Carie! I just wrote “buy a journal” on my to-do list. Yours may be the advice that finally will keep me going once I’ve started. Now how do I combat the “why bother at this stage of my life when I should’ve done it years ago?” doubts? Good point, thank you! All I could think of was how many years I’ve lost track of by not keeping one. Better late than never, I guess! That IS such a great point! “Wild and senseless” is a great way to describe my inner monologues. 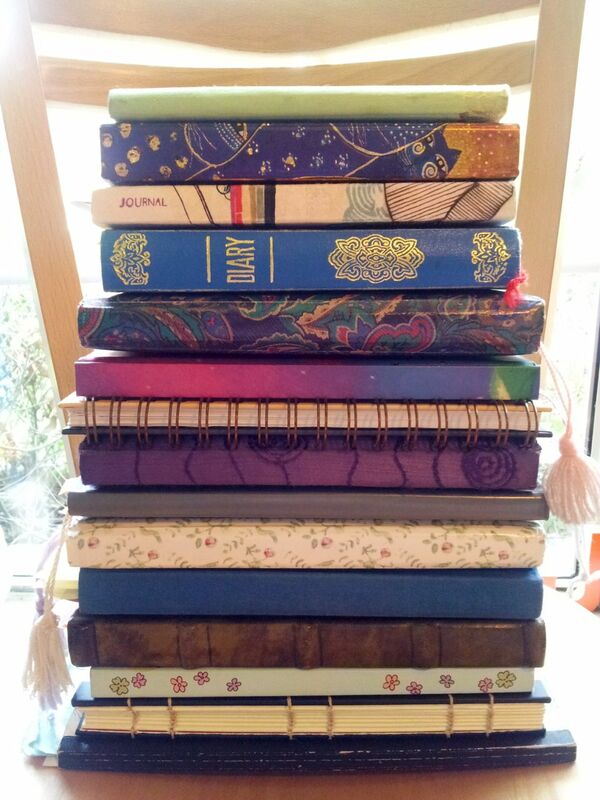 AND many of my journals! 🙂 A thousand years is a long time to go without journaling, but I bet you could get back in the habit.